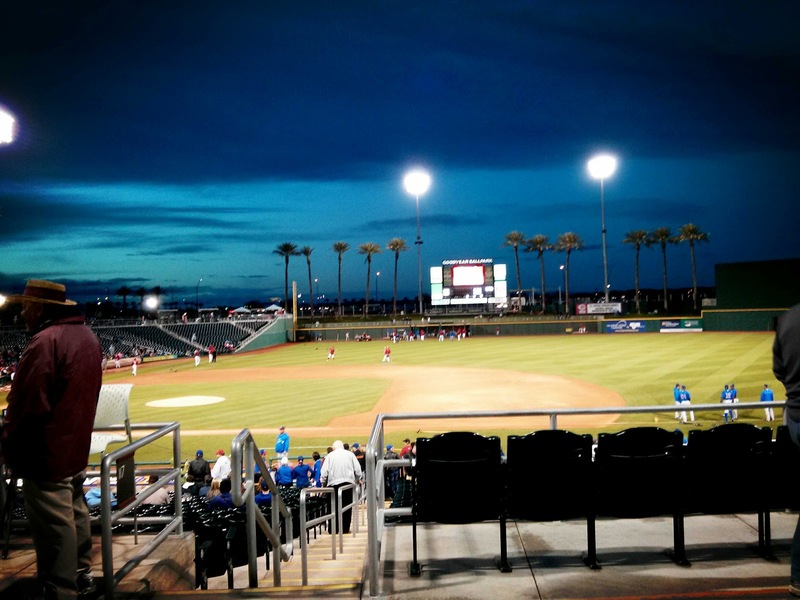 In honor of Opening Day, here's the recap of our trip to Goodyear Ballpark when we were out in Phoenix for the SABR Analytics Conference. 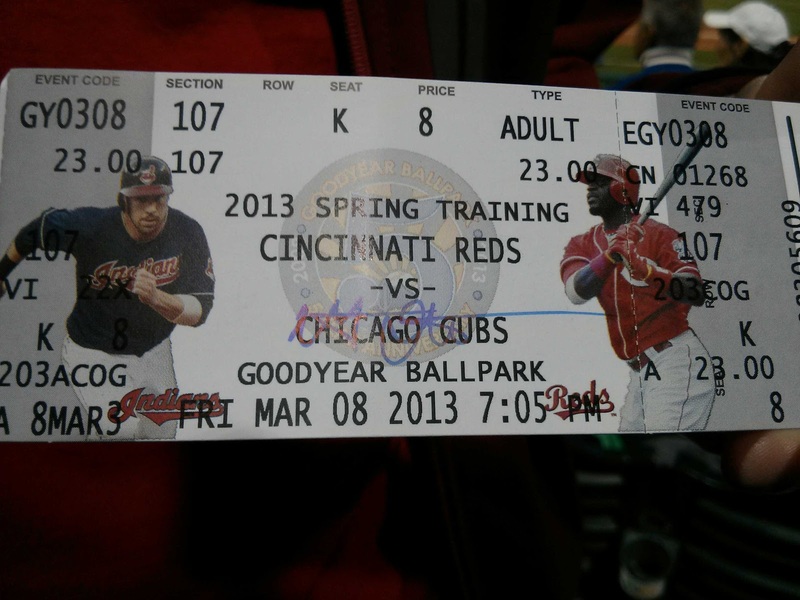 Since becoming an active baseball fan, one thing I really wanted to do was go to a Spring Training game. I realized I would get my wish with our trip to Phoenix. Or at least, I thought so. It never occurred to me that the weather would be bad in the stupid desert. But it was rainy and cold for most of the time we were in Arizona (it was beautiful the day we got there and the day we left, but in between, not so much). The weather cleared up just enough for them to not cancel the game in advance. I made friends with the GWU Business School people I found the night before at the welcome reception and they agreed to take us out to Goodyear (it is not close at all to Phoenix, something like 20 miles away). The promise of gas money is a pretty great tool. Goodyear is a nice, small, out-of-the-way ballpark. I knew it was going to be small but I didn't expect it to feel smaller than the Indianapolis Indian's MILB ballpark. The half hour we had of nice (although cold) weather let us walk around a bit and it looked like it would be a great ballpark when the weather is warm. Eric managed to finally get Mat Latos' autograph. Nobody else was signing, and our tickets were right down from the dugout. (Spring Training tickets are significantly cheaper than during the regular season, so we went ahead and got ourselves some nice ones.) This was the second time Eric had talked with Mat (the first was during warm-up and Eric asked him a couple of questions about when the pitchers take batting practice), and he seems like a nice guy and has answered the questions Eric wants to ask him. 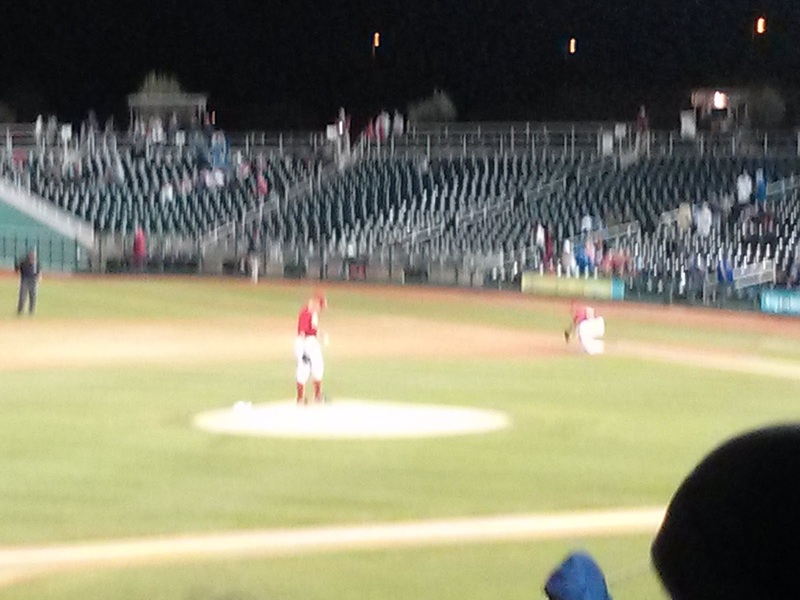 There were only two things I didn't like about Goodyear Park that the people there could control (see: weather). 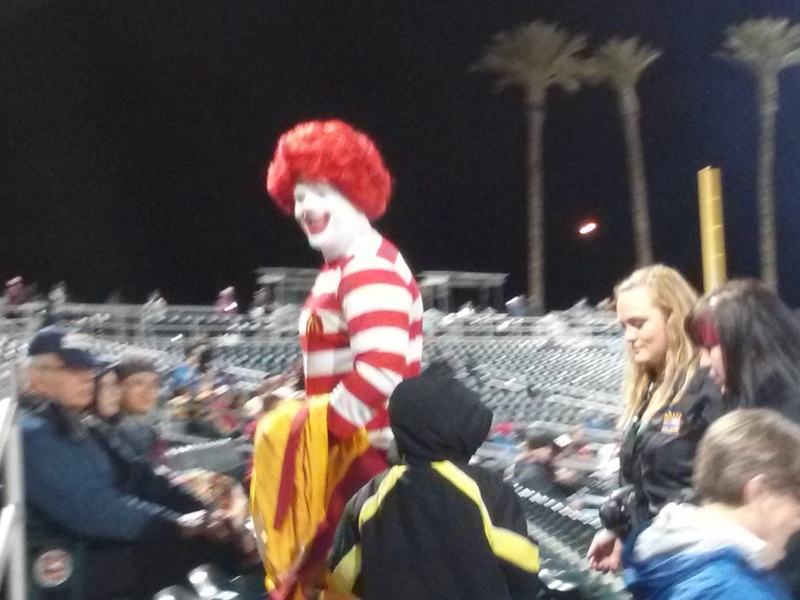 There was a really really really creepy looking Ronald McDonald walking around the field and stands. I get sponsors and all that, but I do not think we need to scar everyone by seeing a creepy clown walking around. It was pretty disturbing. The other thing that was sad was the Skyline Chili was closed this particular night. Of the four of us who went (Eric, me, and the two GWU MBA students), three of us were crazy looking forward to Skyline. The fourth was from Texas and didn't know what he was missing. But then we saw the terrible, terrible sign on the stand that said they were closed. And we were so sad. 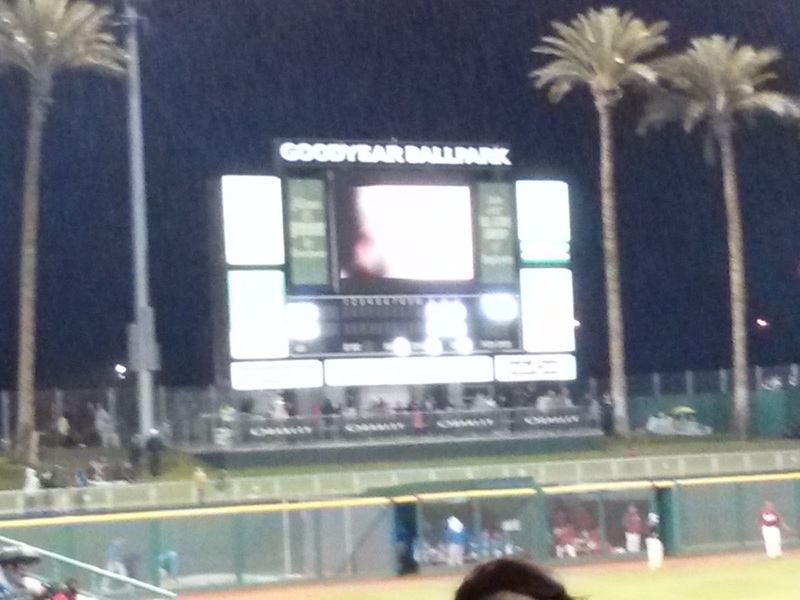 The game was delayed for some reason, and literally 3 minutes before it was about to start, it began raining. You can see the rain in these two photos. The game only lasted an inning and a half before getting called. 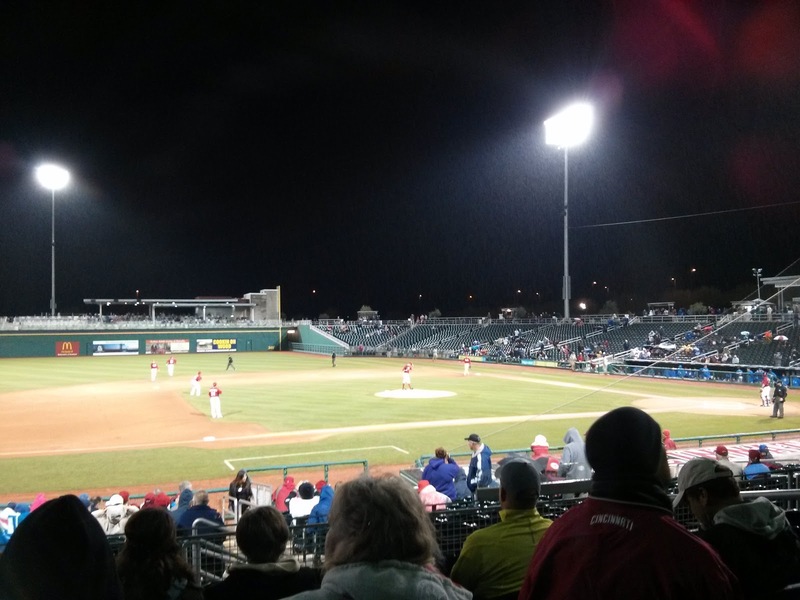 It was a bummer, but we did get to see the park, got an autograph, and it is kind of a funny story that it was freezing cold and raining during a Spring Training game in Phoenix. In any case, I am simply ecstatic for baseball season to officially begin today! I love the Cincinnati Reds and have high hopes for this season. We have tickets for 3 of the games when the Reds come to DC against the Nats (the only game we're not going to is the night I have my last class of the semester/grad school, which I ought not miss). Some day we will go to Opening Day in Cincinnati, but until then, we have MLB.TV set up and ready to go, and Eric's coming home early to watch. Let's go Reds!